I love all the “real” myths. The ancient stories, as old as humanity, which resonate and repeat around the world, answering questions about the origins of everything: how did the world begin, how do we make our place in it, where did we come from, where are we going? They answer the earliest questions, questions of conception, birth, creation. In the grand scheme of things, America is a very young nation. We’re teenagers, maybe. Or maybe we’re at that age just past adolescence when our swagger starts to falter, and we try to relive our glory days and we regret the insouciance of our youth. Accordingly our own mythological figures, our superheroes, have more adolescent concerns. These are the stories we all know, as Americans, these are the tales of valor, the epic struggles, the characters with godly speed and strength, with more-the-human abilities. And they help us to address, as a nation, all of the anxieties in our teeming teenage brain. How do we explain the changes in our body, which we can neither understand nor control? And these changes bring about a strange new power, which we can neither understand nor control. And, as we all know, with great power comes great responsibility, and if there’s one thing teenagers hate, it’s responsibility. Superhero myths help us to work through anxieties about the source of our power–the science and technology that have changed our lives faster than we can compute. They helped to make us a super power, but they made us dangerous, too, and our morality didn’t always develop at an equivalent rate. The older myths tried to make sense of the justice or lack of it that people faced every day, and our superhero stories do this, too. When our authority figures mete out unfair punishments, just as in the earlier myths, super people and lesser gods try to trick the most powerful. Our superhero stories help us to understand evil, the dark side, and that it’s sometimes part of ourselves, confusing and strangely compelling. And they reflect a strangely American optimism: anything is possible, ordinary people are capable of great things. My boys have known the superhero stories almost sense they could talk. They seem to have learned them by osmosis. And as long as they could talk they’ve imagined powers for themselves, they’ve invented “guys,” who are capable of weird and wonderful things. They give them a history, an origin story, they draw them and sing songs about them, and they become them as they fly down the street, leaving all the worries of the real world behind. 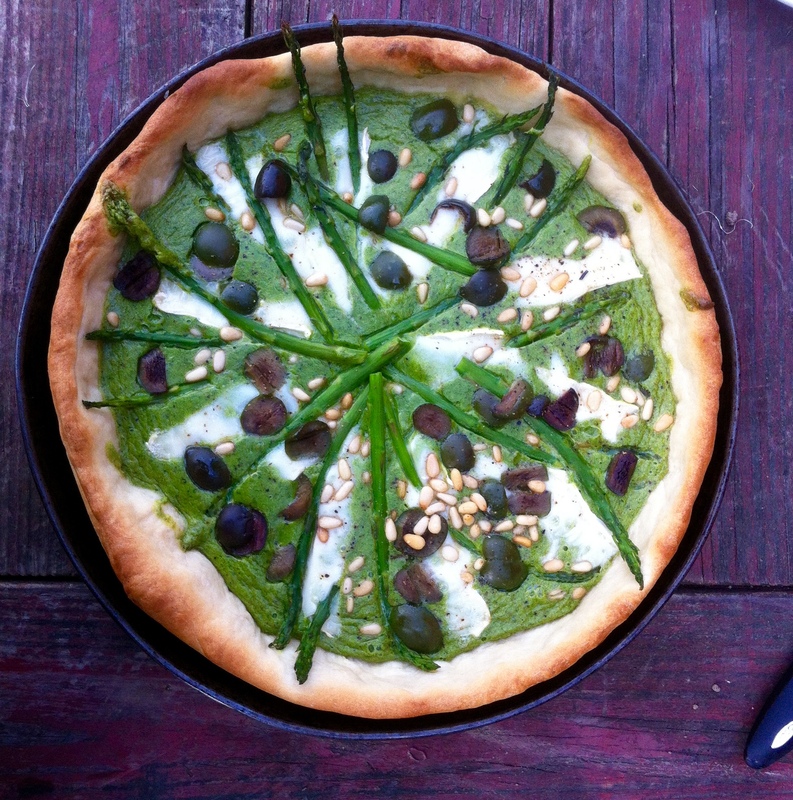 I tried to put every green thing I could think of in this tart! So it’s got spinach and arugula and tarragon inside, and it’s got bright castelvetrano olives, asparagus and pistachio nuts on top. It was a nice combination…juicy and bright and nutty all at once. Here’s MF DOOM’s Beef Rap, with the spiderman samples!